3c. Massachusetts Bay — "The City Upon a Hill"
This woodcut represents the earliest known map of New England from 1677. The mapmaker showed west at the top with north to the right. The passengers of the Arbella who left England in 1630 with their new charter had a great vision. They were to be an example for the rest of the world in rightful living. Future governor John Winthrop stated their purpose quite clearly: "We shall be as a city upon a hill, the eyes of all people are upon us." The Arbella was one of eleven ships carrying over a thousand Puritans to Massachusetts that year. It was the largest original venture ever attempted in the English New World. The passengers were determined to be a beacon for the rest of Europe, "A Modell of Christian Charity," in the words of the governor. 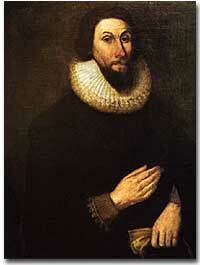 John Winthrop travelled to the New World aboard the Arbella. He was elected and dismissed as governor of the Massachsetts Bay Colony several times. Puritans believed in predestination. This doctrine holds that God is all-powerful and all-knowing; therefore, the fate of each individual soul is known to God at birth. Nothing an individual can do or say could change their ultimate fate. Puritans believed that those chosen by God to be saved — the elect — would experience "conversion." In this process, God would reveal to the individual His grace, and the person would know he was saved. Only the elect could serve as Church members. If a person were truly saved, he would only be capable of behavior endorsed by God. These "living saints" would serve as an example to the rest of the world. During the early years, ministers such as John Cotton carefully screened individuals claiming to have experienced conversion. The colony needed more than a fervent church to survive. 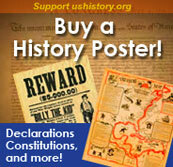 Many dissenters — Christian men and women who were not converted — also lived within the ranks of Massachusetts Bay. Towns such as Marblehead were founded by non-Puritan settlers. The Puritans allowed this for the sake of commerce. Many skills were necessary for a vibrant economy. This engraving shows the Harvard campus as it looked during the 18th century. An elected legislature was established, echoing the desire for self-government already seen in other English colonies. Although ministers were prohibited from holding political office, many of the most important decisions were made by the clergy. In 1636, Harvard College was instituted for the purpose of training Puritan ministers. By the end of the 1630s, as part of a "Great Migration" of Puritans out of England, nearly 14,000 more Puritan settlers came to Massachusetts, and the colony began to spread. In 1691, Plymouth colony, still without a charter, was absorbed by their burgeoning neighbor to the West. The great experiment seemed to be a smashing success for the first few decades. In the end however, worldly concerns led to a decline in religious fervor as the 1600s grew old. John Winthrop penned this view of the ideal life, also known as the "Arbella Covenant," as he sailed to Massachusetts. The Bay Psalm Book was the first book printed in British North America. In addition to containing psalms, there was a "discourse on lawfullness." The edition consisted of 1,700 copies. This site contains 4 images of the original work with brief background info. An account of the voyage to America of the 11 ships in Winthrop's fleet, by a descendant of one of the passengers. The names John Winthrop and King James I are familiar, but what about Henriette-Marie, Lord Robert Rich, and Sir Henry Vane, Jr.? How are they connected to the history of the Massachusetts?